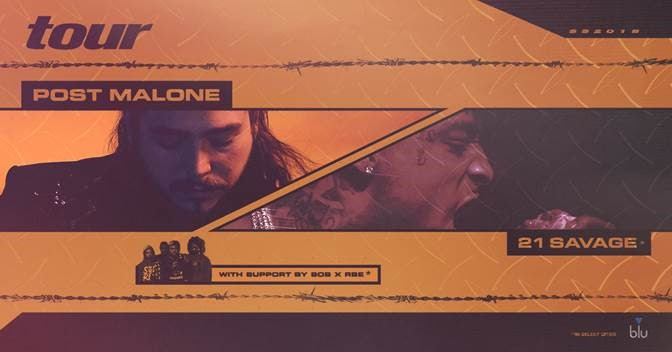 multi-platinum artist Post Malone announced his upcoming North American tour with multi-platinum rapper 21 Savage and special guest SOB X RBE. Produced by Live Nation and sponsored by blu, the outing will kick off April 26 in Portland, OR and make stops in 28 cities across North America including Seattle, Nashville, Toronto, Atlanta, Austin, and more. The tour will wrap in San Francisco, CA on June 24. Tickets will go on sale to the general public HERE starting Friday, February 23 at 10am local time at LiveNation.com. Citi® is the official presale credit card of the Post Malone tour. As such, Citi® cardmembers will have access to purchase presale tickets beginning today, February 20th at 2pm local time until Thursday, February 22nd at 10pm local time through Citi’s Private Pass® program. For complete presale details visit www.citiprivatepass.com. The history-making Dallas, Texas artist, Post Malone, will also release his new single “Psycho” [feat. Ty Dolla $ign] on Friday February 23, 2018via Republic Records. his forthcoming, second full-length album and what promises to be the biggest musical event of 2018, Beerbongs & Bentleys—out soon. Post Malone’s North American tour with 21 Savage and special guest SOB x RBE is sponsored by blu. Designed for smokers, by smokers, blu’s top priority and mission continues to be exceeding the needs of adult smokers with high quality vapor products and e-liquid flavors. To discover blu and experience blu satisfaction, visit www.blu.com/en/US.